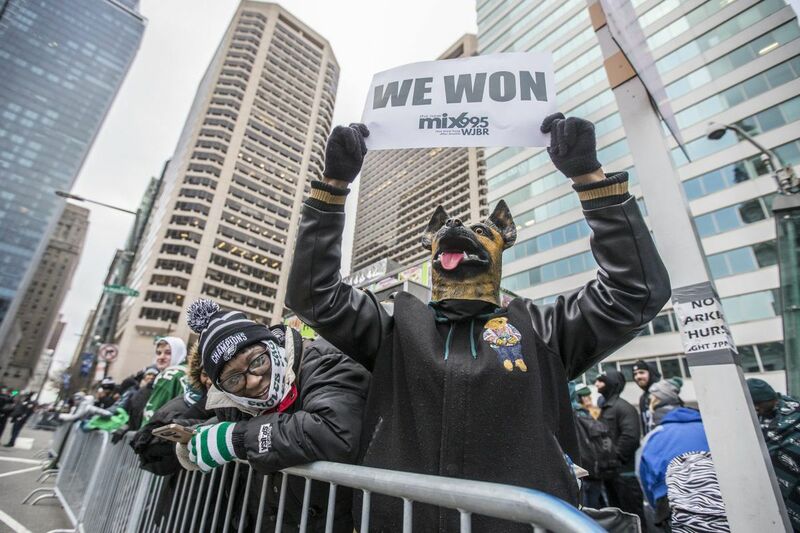 Kevin Edwards, of Bristol Pa., wore his underdog mask and holds up his sign announcing the Eagles’ victory as he and his family secure their spot on the parade route across from City Hall on Thursday Feb. 8, 2018. Philadelphia is just moments away from the start of the Eagles' first Super Bowl parade — you can follow the Inquirer's live coverage here — after a victory against the New England Patriots left the city in a state of utter jubilation all week. Thousands gathered along the Parkway shortly before the start of the parade at 11 a.m., trickling in along the parade route since Wednesday night. For some who say they've waited a lifetime for this moment, getting up a little extra early was no big deal. Groups were heard shouting the "Eagles" chant while beer and orange juice were flowing at 5 a.m. The line at the Wawa at 20th and Hamilton streets, near the museum, had a line wrapped around the block by 6 a.m. And by 8 a.m., lines to the bathrooms at the restaurants near Broad Street and Snyder Avenue snaked through the buildings and out the doors. By 9 a.m., crowds were swelling with no signs of stopping. Some climbed trees along the Parkway to grab a closer look. "It's a bird's nest," Matt Hugel, 19, of Pennsauken, called down. The excitement and crowds grew in tandem as fans neared the parade's start. Mickey Durkin, of Bensalem, took advantage of the slightly less crowded Locust Street, between Broad and 15th streets to play a few quick games of football with his two children and two neighbors. As they threw long passes and sprinted down the street, they dodged crowds of parade-goers flooding toward Broad. Intermittently, Durkin would pause and shout, "E-A-G-L-E-S!" and a chorus of parade-goers along Broad would echo in response. "It's about family today," Durkin said. He and his kids spent the night in the city to avoid any traffic headaches. "It's about all these generations who have never had a win finally coming together." His son, Sonny, is only 11 years old, but the morning excitement was not lost on him either. "It's the best day of my life," Sonny said. "I can't wait to see all of the players." His 9-year-old friend and neighbor, Brian McGinty, was in full agreement, too. "It's the most amazingest day," McGinty said. "I'm going to tell my grandkids about it." Michael Merlini, 39 of Oreland, Pa., was in the food court of the Lit Brothers building at 8th and Market streets around 7 a.m. in his pajamas, dishing out Munchkins from Boston-based Dunkin' Donuts to four kids who were also in pajamas with messy hair. "Yeah, we slept here," Merlini said. Merlini's father has a real estate office a few floors up and to beat the trains and any traffic, a whole crew bunked overnight there. Two of the kids belonged to his friend upstairs and the giant "Box O' Joe" belonged to the adults. Moombi Pressley, 45, of Mount Airy, woke up early fueled up on cult-favorite Wawa coffee to get as close to the Art Museum steps as possible. "That's the only way to do it," Pressley said. Getting out the door in the middle of the night was a common theme for those trying to grab the best positions possible. Steve Buckner, 29 of Pottstown, woke up at 2 a.m. to make his way to the museum with a group of friends. "We've been waiting our whole lives for this moment," he said. "It felt like we were dreaming when we saw the Super Bowl, still feels like we are dreaming." While many schools and businesses gave their employees and students a day off, others had to call out. Brian Spreen and James Hartman, of York and Lancaster, respectively, were two of those people. But it didn't seem to be a problem for their employer. "My boss gets football," Spreen said. Rich Fioravanti, 54, a brick mason from New Castle, Del., said there was no question he would take off from work. He found a spot by the Art Museum well before the sun rose. "I've been waiting 50 years for this," he said. Fioravanti came with his two sons and was enjoying a "big boy" cigar until the parade. "I wouldn't have missed this for the world," he said. But the party wasn't only along the Benjamin Franklin Parkway — many found a spot along Broad Street as well, where buzzing helicopters and cars honking made it clear that today was not any other Thursday. Christine Williams of Levittown, Pa. has found her spot on the parade route at City Hall. She and her family arrived at 6:00 a.m. but they are too happy about the cold this early in the morning. The Philadelphia Eagles hold their Super Bowl Parade down Broad Street on Feb. 8, 2018. One fan, Andrew Timmons, slathered on Kelly green face paint and parked himself at Broad Street and Pattison Avenue at midnight. Bob Hepper — with his daughter, Jane, and a coworker, Bill Miller — waited for the sun to come up over South Broad Street. They arrived Wednesday night from near King of Prussia and slept in cars. "Our job let us have off," Miller said. "But I was going regardless." After its 11 a.m. start near AT&T Station in South Philly, the parade will continue up to City Hall before making its way onto the Parkway and Art Museum between noon and 12:30 p.m.
Staff writers Jason Nark, Claudia Vargas, Amy Rosenberg, Tommy Rowan, Caitlin McCabe, Samantha Melamed and Allison Steele contributed reporting.